In my opinion there are two main types of ruined city archaeological sites. One being where archaeologists have obviously spent time digging, reconstructing, and learning from what has lain below the surface. The second is the type of place where you get the sense that no one has done much digging (grave robbers excluded, of course) and you can feel the mystery that must be scattered among the ruins and in the ground. Pınara belongs in that second category and according to the staff I spoke to at the site there have been no excavations in Pınara that he was aware of. Facts concerning the history of this city are sparse, possibly because there have been no major efforts to excavate the site. 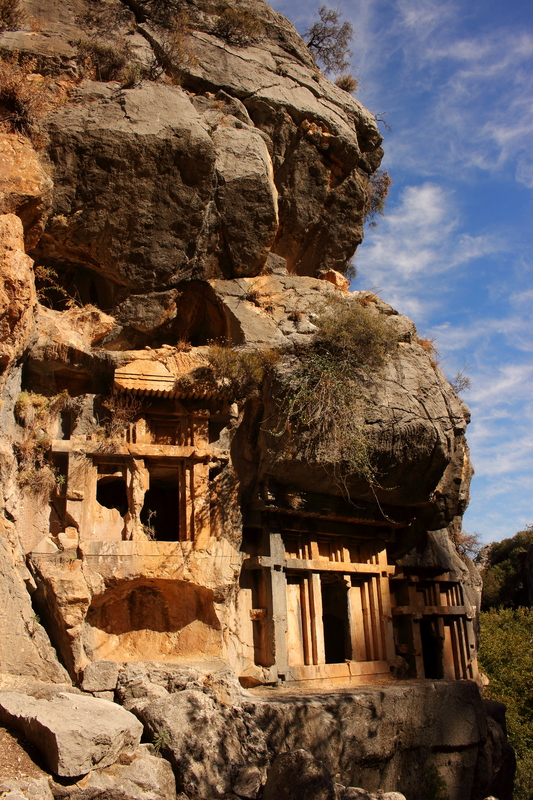 What we do know is that it held a high position in the Lycian League as one of only six cities commanding three votes. It was likely a colony of Xanthians dating around the 5th century BC, surrendered peacefully to Alexander the Great, became a Byzantine Bishopric, and was finally abandoned sometime in the 9th century AD. 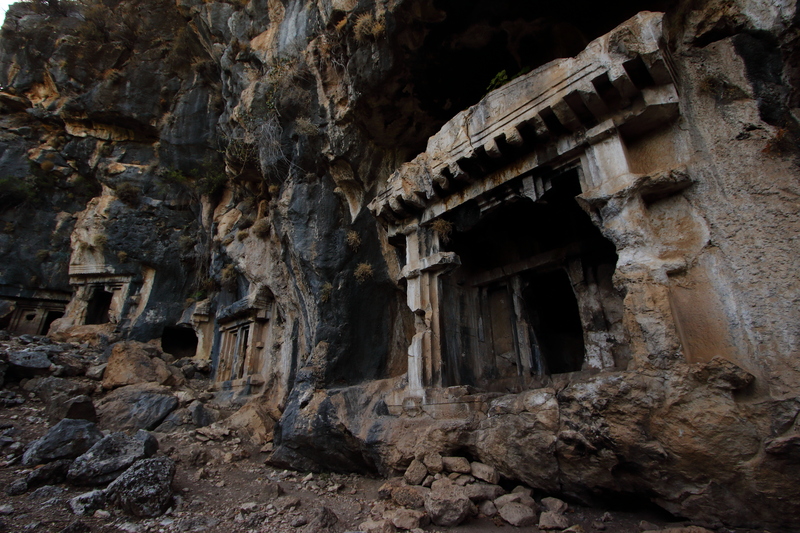 The site is massive when you include the numerous cliff cut graves, sarcophagi, and other burial sites. There is one large theatre in fine condition, as well as a smaller theatre and a temple to Aphrodite that are quite ruinous. While there are the remains of a large church at the site, the majority of the architecture remained overwhelmingly Greek in style with very few of the Roman-era updates that most major cities underwent. The hills above the parking lot are scattered with ruined buildings and, most impressively, numerous tombs and sarcophagi. The most unique feature here is the tall red cliffs above the city that are pock-marked with small graves cut into the sheer cliffs. There are trail markers painted onto the rock to help you find your way around the site and see most of the main tombs, theatres, and temples, though Pınara is also the type of place that is great to wander and explore your own way. Depending on how much you like this kind of stuff it should take at least two hours to see this site properly, more if you really explore. There is no public transit to this site that we are aware of and I’d be shocked if there was anything that comes closer than passing by on the highway. If you take a bus, take the D400 between Fethiye and Kalkan and get off near the town of Minare. It’s a 5.5 Km walk from the highway past the town to Pınara. 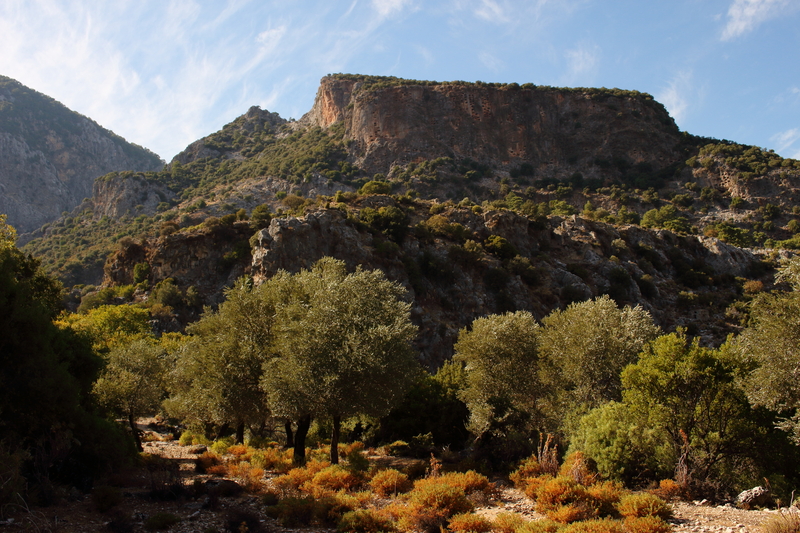 While this is the heart of Turkey’s hiking country and not that far from the Lycian Way Trail, Pınara isn’t included on the route. There is a small dirt road connecting the area to Ölüdeniz that may work if you REALLY want to hike here but we can’t confirm anything about that. Follow the D400 about 35 km from the city of Fethiye towards Antalya then turn off following the brown signs marked Pınara for about 5.5 km’s just past the village of Minare. The last stretch of road is a narrow and rough dirt track, testimony to how under-visited this place is. The immediate area has nothing to offer beyond pitching a tent though it’s probably one of the most friendly areas for camping if that’s what you’re thinking of doing. As far as hotels go the area is full of everything from cheap pensions to luxurious, all-inclusive resorts. Fethiye and its environs seem to have become the British Riviera so most staff will speak excellent English. 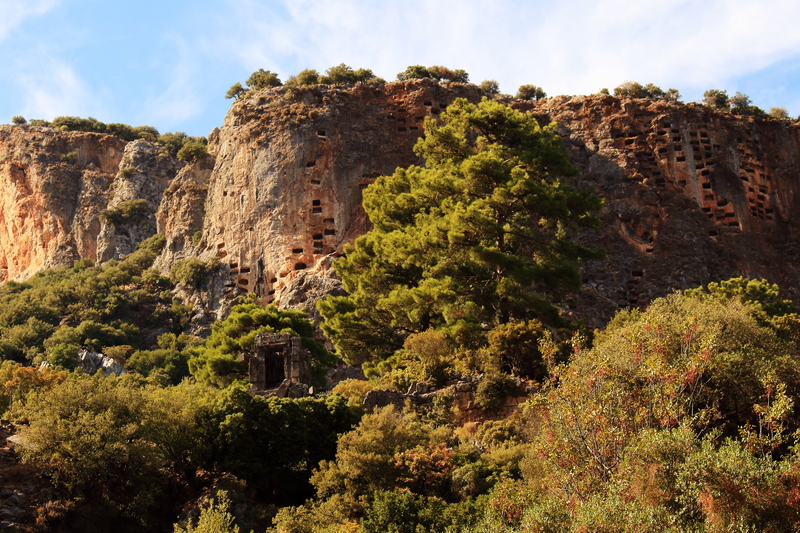 Planning on visiting Pınara? Make sure to check out what other sights are in the area!